On a white background, there is Marquisian patterns drawn in grey color. 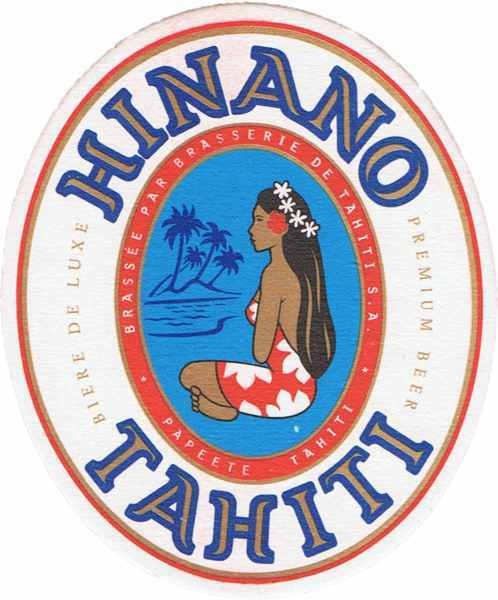 Inside an ovale, the name of the brand Hinano Tahiti, such as the famous local beer brand produced by the Hinano brewery, is written in upper-case letters with a black outline filled in red and grey colors. On each size, the words "South pacific" et "Surfriding" are written. The logo of the brand is a mythical vahine sitting cross-legged, wearing a red sarong with white Tiare flowers and a red hibiscus flower at the ear. At the back, there is an island with coconut tree and 7 stars.